Tension between Ankara and Europe escalated to a new level after the Netherlands refused landing to the Turkish FM’s plane and outright deported a Turkish minister from Rotterdam. RT looks at the biggest political rows that preceded the latest conflict. Turkish President Recep Tayyip Erdogan and his entourage are known for not mincing words when it comes to criticism from European capitals, whether it is linked to meddling in Turkey’s affairs or its relationship with the EU. Germany and Turkey have often found their relationship on the rocks over the past few years. However, the latest spat between Berlin and Ankara may overshadow all previous fallouts due to the Turkish president’s reference to the country’s Nazi past, a particularly sensitive topic in post-WWII Germany. Lambasting the decision to cancel a number of rallies in support of a controversial constitutional reform referendum, Erdogan said: “Germany, you have no relation whatsoever to democracy and you should know that your current actions are no different to those of Nazi period.” As the April vote nears, Turkish officials in Europe have been drumming up support for the constitutional reform, which would expand the president’s powers. The comparison inevitably drew the ire of Berlin, with German Chancellor Angela Merkel slamming Erdogan’s remark as unworthy of comment. 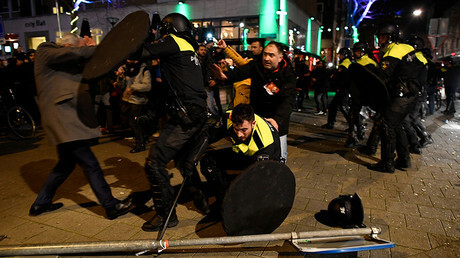 In April of last year, the Turkish Consulate General in Rotterdam made media headlines by asking members of the Turkish community living in the Netherlands to report on fellow citizens who were “insulting our president, the Turkish national or Turkey in general.” The outcry that followed the revelation resulted in the consulate apologizing for the “unfortunate choice of words” in a letter containing the request, which had been sent to a number of Turkish organizations in Holland and subsequently leaked online. Commenting on the scandal, Dutch Prime Minister Mark Rutte appeared to be baffled by the odd instruction and ordered the Dutch ambassador in Ankara to demand an explanation.